Amherst Nurseries has installed numerous landscapes at residences, schools, parks, universities, and industrial sites across the state. We have worked for large contractors such as CIANBRO, O&G Industries, and Aggregate Industries, as well as the Massachusetts DOT, UMASS and other local communities. 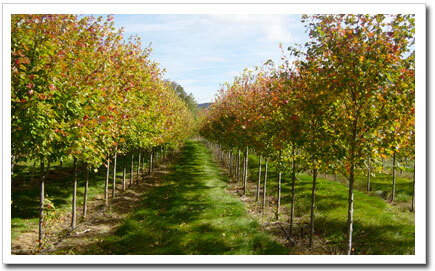 You will find that Amherst Nurseries has the expertise and resources to get the job done correctly and on budget. Read what our customers say about our landscaping services. We grow thousands of trees and shrubs on farms in Sunderland, Charlemont, and Amherst - maintaining over 100 acres of productive farmland. As stewards of highly productive farmland, we work hard to minimize our environmental impact by reducing or eliminating pesticide sprays, growing and selling locally, and reducing soil loss through new technologies and research partnerships with UMASS. View a YouTube video of this research with UMASS. We are strong supporters of local land trusts, whose great work allows us to have land to farm. We are also strong supporters of our community, donating produce to local soup kitchens and trees to homeowners effected by the recent tornado. Click here to view the details of our recent tree donation. Your support is vital to the continued success of our business. Please consider Amherst Nurseries for your next landscaping project or stop by our Retail Store on Route 9 in Amherst. Thank you for your business! !